nCompass is a fully-featured compass that will serve your every compass need - whether you are just trying to find your way back to your car, you are part of a search and rescue team looking for a lost child, or even if you are a military forward observer about to call in an artillery fire mission or F-18 air-strike. You may choose any picture from the camera roll or take a new picture and use it as the face of your compass. Perfect for putting your organization logo or a picture of your favorite person. You want to be able to know what direction you are going in your car and also want to be able to see a picture of your loved one at the same time. Mount the iPhone to your car windshield and set the compass face to your favorite picture. You are going to an amusement park and have just parked your car in a huge lot with thousands of other cars. Set your custom north to your current location and the compass will always point you back to exactly where your car is. A child is lost in the woods and your search and rescue unit is tasked to comb a certain quadrant. Use the UTM coordinate feature and compass to ensure you are exactly where you need to be. You are in the mountains of Afghanistan and discover a Taliban stronghold. 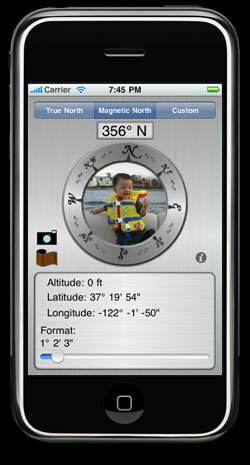 Use the true North compass directions and your location in MGRS format to call in a polar fire mission or air-strike. If you are unsure about your iPhone's capabilities, you can test out its functionality with our free basic compass app, ayeCompass.